In this portrait of the flamboyant Milanese courtier Francesco Filelfo (1398-1481), Diana Robin reveals a fifteenth-century humanism different from the cool, elegant classicism of Medicean Florence and patrician Venice. Although Filelfo served such heads of state as Pope Pius II, Cosimo de' Medici, and Francesco Sforza, his humanism was that of the "other"--the marginalized, exilic writer, whose extraordinary mind yet obscure origins made him a misfit at court. 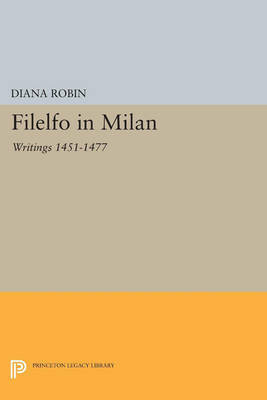 Through an exploration of Filelfo's disturbing montages in his letters and poems--of such events as the Milanese revolution of 1447 and the plague that swept Lombardy in 1451--Robin exposes the extent to which Filelfo, once viewed as an apologist for his patrons, criticized their militarism, sham republicanism, and professions of Christian piety. This study includes an examination of Filelfo's deeply layered references to Horace, Livy, Vergil, and Petrarch, as well as a comparison of Filelfo to other fifteenth-century Lombard writers, such as Cristoforo da Soldo, Pier Candido Decembrio, and Giovanni Simonetta. Here Robin presents her own editions of selections from Filelfo's Epistolae Familiares, Sforziad, Odae, and De Morali Disciplina, many of these texts appearing for the first time since the Renaissance. Originally published in 1991. The Princeton Legacy Library uses the latest print-on-demand technology to again make available previously out-of-print books from the distinguished backlist of Princeton University Press. These editions preserve the original texts of these important books while presenting them in durable paperback and hardcover editions. The goal of the Princeton Legacy Library is to vastly increase access to the rich scholarly heritage found in the thousands of books published by Princeton University Press since its founding in 1905.